UK astronaut Tim Peake described his first walk in space as "exhilarating", as he posted photos - including a selfie - of the feat on Twitter. 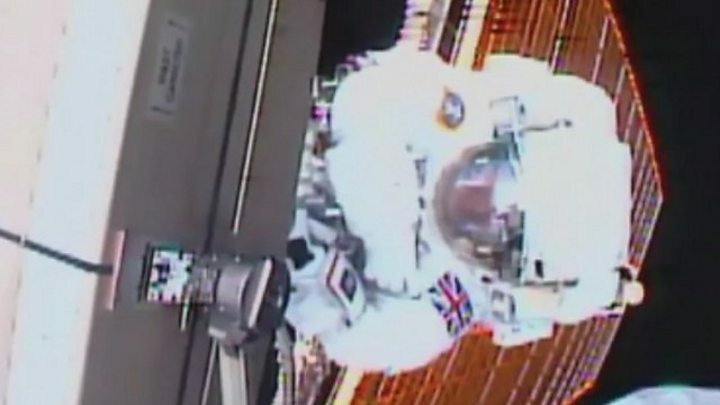 It will "be etched in my memory forever - quite an incredible feeling", said Peake, the first astronaut representing the UK to carry out a spacewalk. He and US colleague Tim Kopra were outside the International Space Station (ISS) for almost five hours on Friday. But the operation was cut short after water leaked into Col Kopra's helmet. The pair had already replaced a failed electrical box, which was their main objective. After they returned and were safely inside with the outer airlock hatch closed, Major Peake thanked mission controllers: "You guys did a great job." Later on Friday night, he posted two tweets, two hours apart. His first included three photographs and by Saturday morning it had had more than 9,000 retweets and 18,000 likes. It included a selfie that showed his camera in the reflection of his helmet. 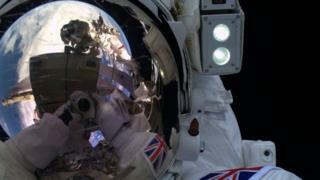 A later tweet from Maj Peake said: "Wrapping up today's spacewalk activities. Huge thanks to the ground teams who make it all possible & keep us safe out there - you guys rock!" His colleague Tim Kopra also posted photos from the spacewalk, including one of him emerging from the airlock and another of him carrying out repairs on the end of the space station. Maj Peake's parents later spoke of their excitement at watching their son fulfil a long-term ambition. "We are absolutely thrilled. This is a proud day," his mother Angela said. Before the spacewalk, the couple said they had watched the ISS fly over their home in the West Sussex village of Westbourne. "It was a brilliant pass in clear blue skies... it seems quite surreal that your son is up there," his father Nigel Peake said. The spacewalk was expected to last more than six hours but was halted at 16:58 GMT on Friday when a water globule measuring a few inches across developed inside Col Kopra's helmet. Nasa is under a ruling to terminate a spacewalk under such circumstances after an incident in 2013, when a European astronaut developed a significant helmet leak and nearly drowned. A sample of water and absorption pads from inside the Col Kopra's helmet were collected by the crew as evidence for investigators to determine the cause of the leak.